This week we learned a lot: Wade Messer was an unreliable CI for the US Attorney, cousin Johnny doesn’t like the sound of Boyd’s voice–“using every word in the Webster’s without saying a thing”–and Jesus does listen to prayers. Even the prayers of heat-stroked Dewey Crowe. 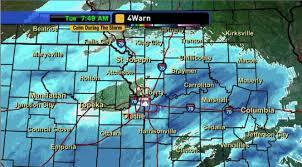 Also–and not really related to Justified–when it snows over 6 inches in Manhattan, Kansas, the entire city shuts down. Luckily, this means that we were able to recap this week’s episode–just in time! Steven: Perhaps my biggest question–and I will admit that I’ve already read what Graham Yost had to say about the episode–concerns Wade Messer’s informant work. He seems like an odd choice, even if he’s been able to give the feds the occasional piece of information. How did he get into a position to inform? Will Tim become more important for this plot line? Or was it just a good excuse get U.S. Marshall, Raylan Givens, involved in Wade’s disappearance? Susan: I have not read what Mr. Yost had to say, so my guess about the Wade plot is that it was added in later to help connect the dots. Even the bit about Wade admitting to Dewey that Boyd made him take the money seemed like new information to this episode, though it was included in the “previously on” clips. Am I crazy or was that some clever editing? That being said, it was all worth it. The scene with Dewey and Wade and the webelo shovel was just delightful. It also gave us our first Boyd and Raylan scene of the season and tied together Art’s continued distrust of Raylan. So even if they did come up with it midstream, I’m glad they came up with it. But let’s talk about that Boyd and Raylan scene for a minute. Is it just me, or does the dialogue turn almost Shakespearean between those two? 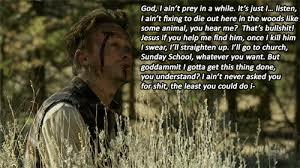 Johnny may not like the sound of Boyd’s voice, but hearing Raylan and Boyd verbally spar still makes me giddy. My curiosity lies with Dewey. How long can he fend off Darryl? Or, at the very least, pretend that he’s fending off Darryl? I feel as though this whole situation will not end well for Darryl, but I’m not sure if it will be an ironic end (Darryl takes over the business and gets what should’ve been due Dewey) or a direct end (Dewey finally retaliates). Maybe it’s Darryl’s hard-to-place accent, but I just don’t think he’s long for Harlan county. Susan: Or maybe it’s the nature of Justified to have the latest villain not live through the season? Darryl is the most troubling part of this season for me. The accent is dreadful, sure, but he’s just not intimidating enough as a Harlan county big bad. What has HE actually done, other than kill the dopey Crowe in the first episode? Right now the Haitian and the pants-less brother with the terrifying dog are way more interesting as villains than Darryl. By the way, that dog scene was the most terrifying thing I’ve ever seen on television. If I were Tim, after that, I’d make a career change. Sure, he might miss out on the occasional scrabble game with Boyd, but his Calvins would thank him. What did you make of the prison plot this week? Are we supposed to think that Boyd, chilly as he is toward his lady love, is still paying for her protection and therefore looking after her? Or is it Johnny that now has the funds and clout to protect her? Will Johnny be the one to get her out before Boyd? Is it really possible for Ava to be romanced by a THIRD Crowder family member? That might be too much, even for this show. Steven: Three does push the line for me as well. Two brothers is awkward, but three is positively primeval. If the Crowder clan isn’t careful they’re going to find themselves in the Old Testament. However, I don’t see Ava going for Johnny. I didn’t see her going for Boyd, but this would just be too far a ledge to walk onto. More generally, I don’t know that I like Johnny being Ava’s protector. It’s the #2 most likely explanation, which seems lazy to me. I think the writers should either go with the most likely explanation (Boyd) or it should be something that will really surprise like David Vasquez, protecting her so that she’ll inform on Boyd. Or, and this is perhaps more interesting, inform on Raylan. I do like that the dog scene was the scariest thing you’ve ever seen. (Perhaps we’ll wait a few more years before getting a dog.) I remembered it, but haven’t been haunted all week by the memory. What has been haunting me a little is the casting of Danny Strong (Gilmore Girl’s “Doyle”–yes, I don’t care how many screen writing Emmys you win, you’ll still be “Doyle” in our house) as abusive prison guard. Was that believable to you or just plain uncomfortable? Susan: Oh, I’m so glad you brought up Doyle! Yes! Suuuuuper uncomfortable. He also can’t do the accent, and I half-expected Paris to jump out and accuse him of not being believable enough. Like it was all some sort of weird psychological experiment they were involved in for the Yale Daily News. Man, Gilmore Girls was a great show. I hope you’re right about Vasquez being Ava’s protector, though. This long story on the edges about Art secretly investigating Raylan is very interesting, and by far the most suspenseful thing the show has going this season. Plus, we got to hear a Canadian criminal (though sadly, not Dave Foley), politely give Art all the details he needed about Raylan and Sammy Tonin while dropping the phrase nom de guerre for good measure. This show! It’s a hoot and a half. There was a lot of award winning dialogue in this one, but Dewey’s retort to Darryl’s sales pitch: “Sounds like you’re selling me tires” wins quote of the week for perfectly encapsulating how sad Dewey’s life is currently. Why do I want a happy ending for him? I can’t believe they’re tricking me into grieving for hapless Dewey Crowe. Second place goes to Walton Goggins for his delivery of the words “foreboding” and “fishing” in his scene with Raylan. I would pay good money for a 5 minute webseries of those two chatting each week. The polite Canadian told Art that Picker is alive and well, hanging out with our good friend Wynn Duffy in Harlan County. No matter what happens with the Crowes, I’ll consider this season a success if we can keep those two alive and active for the rest of the season. Raylan’s lady friend grows less interesting by the episode, but I suppose she was useful this week as her no-good-rotten-horrible-very-bad day led to Raylan taking the youngest Crowe away from the rest of the clan. How long do you think it will take for him to team up with Loretta? Will Raylan’s lady be his social worker too? We’ve seen Raylan not arrest a felon on parole with a gun before (ex: Dewey, in the first episode of the season), but I think he still cuts Boyd a pretty big break in this episode. 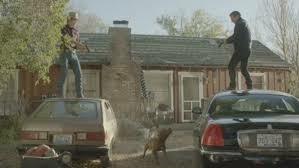 He catches him on his way out, with a loaded gun, obviously in a hurry and in no mood to chat with Raylan and Tim. He’s the leading suspect in Wade’s murder and yet Raylan understands what any Harlan criminal understands, that the Crowe’s are behind this and not Boyd. However, if Raylan really were as keen about putting Boyd in jail as he says he is, he could have taken him in just to be a jerk. (Ex: shooting up Dewey’s hot tub in the first episode of the season). Instead, he makes Boyd play Scrabble with Tim and lets him get back to his business. Raylan still respects Boyd, and I fear it will come back to bite him now that Vasquez and Art are taking a closer look at his dealings in Harlan. Tonight: more Justified. This weekend: a more timely recap. Watch out for dogs.